As far as I'm concerned [Barack Obama] is a 'Baruch,' which means a blessing. He is a blessing to the United States Senate, to America, and to our shared hopes for better, safer tomorrows for all our families. The gifts that God has given to Barack Obama are as enormous as his future is unlimited. As his mentor, as his colleague, as his friend, I look forward to helping him reach to the stars and realize not just the dreams he has for himself, but the dreams we all have for him and our blessed country. Joe proclaims that Obama will make America safer and said he would help Obama realize all the dreams for our country. Will he say this with pride during the GOP convention? Let's see if the media brings this up when they cover his speech. Vetting the Veep...post announcement | AndrewHalcro.com: The campaign of John McCain has sent a staff of eight people into Alaska to conduct background checks and vetting on Governor Sarah Palin. Word is they have have eight rooms reserved at a Wasilla hotel. And when all this fine philosophy was over... he would pursue his business or his pleasure, take his repose or his diversion, with the same ease and tranquillity, as if no such accident had happened. But what makes this difference? When our passive feelings are almost always so sordid and so selfish, how comes it that our active principles should often be so generous and so noble? When we are always so much more deeply affected by whatever concerns ourselves, than by whatever concerns other men; what is it which prompts the generous, upon all occasions, and the mean upon many, to sacrifice their own interests to the greater interests of others? It is not the soft power of humanity, it is not that feeble spark of benevolence which Nature has lighted up in the human heart, that is thus capable of counteracting the strongest impulses of self-love. It is a stronger power, a more forcible motive, which exerts itself upon such occasions. It is reason, principle, conscience, the inhabitant of the breast, the man within, the great judge and arbiter of our conduct. It is he who, whenever we are about to act so as to affect the happiness of others, calls to us, with a voice capable of astonishing the most presumptuous of our passions, that we are but one of the multitude, in no respect better than any other in it; and that when we prefer ourselves so shamefully and so blindly to others, we become the proper objects of resentment, abhorrence, and execration. It is from him only that we learn the real littleness of ourselves, and of whatever relates to ourselves, and the natural misrepresentations of self-love can be corrected only by the eye of this impartial spectator. It is he who shows us the propriety of generosity and the deformity of injustice; the propriety of resigning the greatest interests of our own, for the yet greater interests of others, and the deformity of doing the smallest injury to another, in order to obtain the greatest benefit to ourselves. It is not the love of our neighbour, it is not the love of mankind, which upon many occasions prompts us to the practice of those divine virtues. It is a stronger love, a more powerful affection, which generally takes place upon such occasions; the love of what is honourable and noble, of the grandeur, and dignity, and superiority of our own characters. Two things seem salient (i) she fired the state's public safety head for being unwilling to help her in her family's vendetta against her ex-brother-in-law, and (ii) she introduced herself to America by saying that she was against the so-called "Bridge to Nowhere." We've talked about the first. Now it looks as though the second was a flat-out lie. I championed reform to end the abuses of earmark spending by Congress. In fact, I told Congress — I told Congress, ‘Thanks, but no thanks,’ on that Bridge to Nowhere. ‘If our state wanted a bridge’, I said, ‘we’d build it ourselves’. Alaska Senator Ted Stevens (currently under indictment) and Representative Don Young (currently under investigation) were the bridge’s two biggest proponents. But they were unable to convince Congress to fund the infamous bridge from Ketchikan to Gravina Island at the levels it had hoped. Now, instead of Alaska paying $160 million, the cost to Alaska skyrocketed to $349 million. After federal funding had been slashed, Palin was asked if she was still in support of funding the project. She said: Yes. I would like to see Alaska’s infrastructure projects built sooner rather than later. The window is now–while our congressional delegation is in a strong position to assist. Well that assistance never materialized, and Alaska’s congressional powerhouse is tumbling like a house of cards. Senior Senator Ted Stevens is under indictment on seven felony counts. Representative Don Young is under investigation and has spent more than a million dollars of his campaign fund on legal fees…and he hasn’t even been indicted yet. And although Stevens just won his primary bid handily, Young is hanging on by his fingernails while a recount is performed to determine the winner of his contest. His challenger? Sean Parnell, Palin’s Lt. Governor and also the head of the Division of Elections that is in charge of recounting the votes for his own race. You can’t make this stuff up. The third member of the delegation, Lisa Murkowski, was appointed to the U.S. Senate seat by her own father, Senator Frank Murkowski who left the senate to become the governor that Sarah Palin defeated in the 2006 primary. (Are you keeping up with me?) I could keep going, but those are the highlights. Four years ago the chatter among Republicans was that George W. Bush was unqualified to be head of government, but that he knew that, and understood his role, and would let the professionals run the government while he did what he knew he could do well: be head of state--look at the excellent job he had done as frontman and greeter for the Texas Rangers, after he found his feet and found a job he could do. Yes, John McCain's choice of Palin would be criminally negligent if there were actually a chance that she would become president in the next four years--but there is a plan in place by which she would be replaced with someone with foreign policy experience should anything happen to McCain in his first term. Maybe after four years of intensive education she will know enough about foreign affairs to make her a credible possibility for president. McCain is not so incompetent and careless as to have chosen Palin if there actually were something seriously away in her firing of Alaska Public Safety head Moneghan. Moneghan must have done something really bad--not just refused to help Palin take revenge on her ex-brother-in-law. So it's a trap: when the real reason Palin fired Moneghan comes out the Democrats will be sorry. These seem to me to be... fantasy scenarios. They indicate that the best thing for all concerned is simply to shut the Republican Party down today. Talking Points Memo | Getting Real About Palin: The Palin family had a feud with Wooten prior to her becoming governor. They put together a list of 14 accusations which they took to the state police to investigate -- a list that ranged from the quite serious to the truly absurd. The state police did an investigation, decided that 5 of the charges had some merit and suspended Wooten for ten days -- a suspension later reduced to five days. The Palin's weren't satisfied but there wasn't much they could do. When Palin became governor they went for another bite at the apple. Palin, her husband and several members of her staff began pressuring Public Safety Commissioner, Walt Monegan -- a respected former Chief of the Anchorage police department -- to can Wooten. Monegan resisted, arguing that the official process regarding Wooten was closed.... Eventually, Palin got fed up and fired Monegan.... [Palin's] central bad act was firing the state's top police official because he refused to bend to political pressure from the governor and her family to fire a public employee against whom the governor was pursuing a vendetta -- whether the vendetta was justified or not. Soon after this, questions were raised in the state about Monegan's firing and he eventually came forward and said he believed he'd been fired for not giving in to pressure to fire Wooten. After Monegan made his accusations, Palin insisted there was no truth whatsoever to his claims. Nonetheless, a bipartisan committee of the state legislature approved an investigation. In response, Palin asked the Attorney General to start his own investigation which many in the state interpreted as an effort to either keep tabs on or tamper with the legislature's investigation. Again, very questionable judgment in someone who aspires to be first in line to the presidency. The Attorney General's investigation quickly turned up evidence that Palin's initial denials were false. Multiple members of her staff had raised Wooten's employment with Monegan. Indeed, the state police had a recording of one of her deputies pushing Monegan to fire Wooten. That evidence forced Palin to change her story. Palin said that this was the first she'd heard of it and insisted the deputy wasn't acting at her behest, even though the trascript of the recorded call clearly suggested that he was. We rely on elected officials not to use the power of their office to pursue personal agendas or vendettas. It's called an abuse of power. There is ample evidence that Palin used her power as governor to get her ex-brother-in-law fired. When his boss refused to fire him, she fired his boss. She first denied Monegan's claims of pressure to fire Wooten and then had to amend her story when evidence proved otherwise. The available evidence now suggests that she 1) tried to have an ex-relative fired from his job for personal reasons, something that was clearly inappropriate, and perhaps illegal, though possibly understandable in human terms, 2) fired a state official for not himself acting inappropriately by firing the relative, 3) lied to the public about what happened and 4) continues to lie about what happened. Steph Laberis: Don't Flash the Octopus! The Warming Pan Baby: James [II Stuart] was disliked for a variety of reasons, the most notable is that he was Catholic.... English people were devoutly of the English Church, which itself was a form of Protestantism.... James II openly broke active laws like Test Act and appointed Catholics to positions in the military, the Universities of Caimbridge and Oxford, and government positions too. Not to mention the 7 Bishops case.... James II had two daughters from his first wife, both of whom were Protestant. However, James II... remarried... a Catholic princess.... On June 10, 1688, James's new wife, Mary of Modena gave birth to a son, James Francis Edward Stuart. This did not bode well for the followers of the Church of England.... [I]t now looked like a Catholic dynasty was emerging.... What did ensue was perhaps the most scathing and vicious lie ever devised by the slanderous mouth of mankind. The rumor was that the baby, little Jimmy Frankie Eddie Stu, was not James II's, nor his wife's. It stated that the baby, while it was a boy, died in childbirth and that James II had "acquired" a substitute child.... During the middle ages... aristocrats often had the kitchen in a different building.... The food, after it was cooked, was placed into... warming pans... sent up to the dining hall. The baby was said to have been smuggled into the castle under one of the many warming pans brought to the King for dinner. Yet a remarkable number of somewhat-normal people believed it, at thetime. Off St. Petersburg, water temperatures have been 2 to 4 degrees above the 80-degree average for this time of year. In Fort Myers, temperatures have been similar. If that warm water continues to deepen and spread, it could be disastrous if a hurricane enters the gulf. … The gulf, with its loop current of deep, warm-water pools, is a hurricane minefield. If the water heats up enough, it can send storms spinning headlong into the coast. Agency leader changed ruling in trooper case - Juneau Empire: A former top official of the Alaska State Troopers reversed a finding in a 2005 investigation of the conduct of trooper Mike Wooten, the former brother-in-law of Gov. Sarah Palin, a step that's unprecedented, according to the head of the trooper's union. John Cyr, executive director of the Public Safety Employees Association, said former Alaska State Trooper Col. Julia Grimes punished Wooten, who has a rocky relationship with the Palin family, for drinking beer before and while operating a marked patrol car even though there was no "just cause" to do so. An earlier internal investigation done in 2005 by Sgt. Ronald Wall, who is now a lieutenant, found that those claims were unsubstantiated. Cyr said it was the first and only time he'd seen the findings of an internal investigation in a trooper's conduct revised by a top agency official. "It's totally outside the expected norm," Cyr said. Cyr said when he asked Grimes why she had reversed the agency's own findings, she said: "Are you going to call Sarah Palin a liar?" Wooten has become a key figure in a political imbroglio for Palin that began when she fired former Department of Public Safety Commissioner Walt Monegan on July 11. Monegan said he was pressured by members of Palin's family and administration to fire Wooten after Palin took office. Palin has denied those claims and said Monegan's dismissal was the result of her seeking a new direction for the department.... Palin was questioned twice by Wall regarding Wooten. She also wrote a letter to Grimes accusing Wooten of a multitude of sins, including driving a patrol car with a beer in his hand. In her letter, Palin said Adrian and Marilyn Lane, who are friends of Palin's family and who lived in the same subdivision as Wooten, had seen him drink a beer at their house and then drive off in a patrol car "waving with beer in hand." In their interview with the investigator, Wall, the Lanes said they had seen Wooten come by their house and drink a beer before driving his patrol car during the summer of 2004. John McCain Says His Behavior While Katrina Hit New Orleans Was "Inappropriate"
Yet another reason to believe that John McCain does not have the judgment to be president. 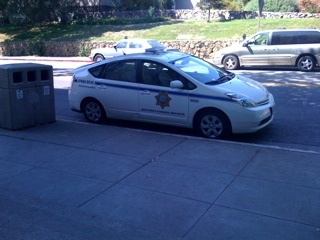 Yes, that is a Berkeley police Prius. P.Z. Myers Blogs About Zhou Q, Brown J, Kanarek A, Rajagopa J, Melton DA (2008), "In Vivo Reprogramming of Adult Pancreatic Exocrine Cells to β-Cells," Nature Aug 27. A lot of attention has been paid to embryonic stem cell and adult stem cell technologies, and those are both important and provide research and treatment opportunities that must not be neglected, but this is a third way: mastering the developmental control genes of the cell so that we can reprogram mature cells into any cell type we need.... This is the direction developmental medicine can take us — I hope you're all ready to support it. Moira Whelan: What's wrong with this Hurricane? : I just noticed that the daily brief customarily done in advance of a hurricane is happening because Gustav is bearing down on the Gulf Coast... is being given by NORTHCOM. So what does this tell us and why does it matter? It tells us that things are as broken as they were before Katrina. The military, like EPA, Commerce, or anyone else, is only involved in emergency management to the point that they are requested to do so by the governor or the FEMA director.... If a governor is worried things are getting out of control, they ask the President to provide help through FEMA.... FEMA is then in charge of coordinating the resources of the federal government to support the governor and the state. In a sense, when FEMA is working properly--as it did under Clinton--when the FEMA director tells another Federal agency to do something, it's as if the President is calling. The government agency is expected to deliver and cut through red tape to make things happen and happen fast. The other thing to remember here is that this is not a mission the military wants.... [T]heir job is to fight wars, not deal with disasters.... The bottom line is that things will not work the way they should with NORTHCOM in charge. Governors don't take orders from Generals. No one else in government takes orders from DoD. No one in emergency management even knows what NORTHCOM does, except come in and issue "orders" to a bunch of civilians who don't work for them. I hope for the sake of the people on the Gulf Coast that the hundreds of civilians who want to do right by them prevail over the system that the Bush Administration has failed to fix. [T]his is not to disparage Palin. Her views seem very extreme to me.... [But t]he problem is there is absolutely no way on earth that John McCain can know what sort of person she really is, which is why this choice--his first major presidential decision--should be a matter of real concern for all Americans. He has proven himself, yet again, ready on day one--to shoot from the hip. Clinical and Actuarial Judgment Compared: For something like fifty years now, psychologists have been studying the question of "clinical versus actuarial judgment".... Say you're interested in diagnosing heart diseases from electrocardiograms. Normally we have clinicians, i.e., expert doctors, look at a chart.... Alternately, we could ask the experts what features they look at, when making their prognosis, and then fit a statistical model to that data, trying to predict the outcome or classification based on those features.... This is the actuarial approach, since it's just based on averages --- "of patients with features x, y and z, q percent have a serious heart condition". The rather surprising, and completely consistent, result of these studies is that there are no known cases where clinicians reliably out-perform actuarial methods, even when the statistical models are just linear classification rules.... In many areas, statistical classifiers significantly out-perform human experts. They even out-perform experts who have access to the statistical results, apparently because the experts place too much weight on their own judgment.... [H]uman experts are... no better than simple statistical models. The "clinicial versus actuarial" results... do not reflect the "natural" conditions of clinical judgment.... What one really wants is a representative sample of actual cases, comparing the normal judgment of clinicians to that of the statistical models. This may have been done; I don't know. The "fast and frugal heuristics" results are... irrelevant.... [A]daptive mechanisms [that] let us figure out good heuristics in everyday life don't apply in the situations where we rely on clinical expertise.... [S]omething... about the conditions of clinicial judgment... render our normal cognitive mechanisms ineffective there. I am not sure "improved" is the word they really want to use here. Unlike, say, the McCain campaign. Statistics 36-350: Data Mining (Fall 2008). I should note that "data mining" in statistics has a very different meaning from "data mining" in economics. Mudflats seems to make sense of what is going on up in Alaska. The word is that McCain and his staff knew absolutely none of this as of yesterday morning. The word is that the Lieberman people in McCain's camp insisted on anyone but Romney, the Romney people insisted on anyone but Lieberman, Pawlenty bubbled up--but then McCain decided that Pawlenty was too boring and picked Palin in spite of having only met her once in his life. What is McCain Thinking? One Alaskan’s Perspective. « Mudflats: Sarah Palin’s sister Molly married a guy named Mike Wooten who is an Alaska State Trooper. Mike and Molly had a rocky marriage. When the marriage broke up, there was a bitter custody fight that is still ongoing. During the custody investigation, all sorts of things were brought up about Wooten including the fact that he had illegally shot a moose (yes folks this is Alaska), driven drunk, and used a taser (on the test setting, he reminds us) on his 11-year old stepson, who supposedly had asked to see what it felt like. While Wooten has turned out to be a less than stellar figure, the fact that Palin’s father accompanied him on the infamous moose hunt, and that many of the dozens of charges brought up by the Palin family happened long before they were ever reported smacked of desperate custody fight. Wooten’s story is that he was basically stalked by the family. No doubt about it. In fact, as the governor herself acknowledged in her acceptance speech, she never set out to be involved in public affairs. She has never publicly demonstrated the kind of interest, much less expertise, in federal issues and foreign affairs that should mark a candidate for the second-highest office in the land. Republicans rightfully have criticized the Democratic nominee, Sen. Barack Obama, for his lack of experience, but Palin is a neophyte in comparison; how will Republicans reconcile the criticism of Obama with the obligatory cheering for Palin? Or will everyone just be forced to drop the subject? That’s not a comforting possibility. Although no one has the perfect resume and experience isn't everything, it is an important quality to weigh. Palin, if elected vice president, would ascend to the presidency if anything should happen to McCain, who turned 72 today. Celtic Diva's Blue Oasis: BREAKING: McCain Campaign heading to Alaska to investigate: A very reliable source overheard Republican spokesperson McHugh Pierre state TODAY that he had spoken to the McCain Campaign. They are coming to Alaska tomorrow to check out the "Troopergate" investigation. This Is a Defense of John McCain's Choice of Sarah Palin? Bottom line: the Presidency is no place for on-the-job training. But the Vice Presidency certainly can be. She’s an excellent choice. If McCain wins, he’ll have a whole cabinet of officials to help him run the government and advise him on vital decisions. That’s not what he’ll be using Palin for.... [T]his is a good pick. That John McCain had met Sarah Palin once, and spoken to her on the phone once, before deciding to pick her as his running mate? Could they be that crazy? Jonathan Martin: How McCain picked Palin - Politico.com: John McCain first met Governor Sarah Palin at the National Governors Association meeting in Washington in February of 2008 and came away extraordinarily impressed.... Last Sunday, Governor Palin and John McCain had a conversation over the phone.... This past week, Governor Palin arrived with Kris Perry in Flagstaff, Arizona, on Wednesday evening.... Today, John McCain was proud to announce that Alaska Governor Sarah Palin, a proven reformer, will share a partnership with him to shake things up in Washington and to make government more effective for American families. Is John McCain absolutely raving bonkers insane!?!?!? [A]s for that V.P. talk all the time, I’ll tell you, I still can’t answer that question until somebody answers for me what is it exactly that the V.P. does every day? I’m used to being very productive and working real hard in an administration. We want to make sure that that V.P .slot would be a fruitful type of position, especially for Alaskans and for the things that we’re trying to accomplish up here for the rest of the U.S., before I can even start addressing that question. Sarah "Hunting Wolves From Helicopters for Sport Is Fun!" Palin? Is it Quayle season? Dan Quayle, that is. Anybody know a reason to think that Sarah Palin would make a good president? Is the Mendacious Spin Finally Over? SeattlePi: Pat Buchanan, MSNBC's token conservative, was nearly as effusive. The former Reagan speechwriter said Obama's address was "a genuinely oustanding speech," perhaps the greatest convention speech he has heard, adding: "This wasn't a liberal speech at all, it was a deeply centrist speech..."
Ross Douthat: [F]or the most part [Obama's speech] felt surprisingly banal and jury-rigged, and it suffered throughout from a failure to cohere around any single theme or rhetorical style. There was a lot of liberal boilerplate (recruit an army of teachers, tax the rich, etc.) that could have fit easily into any Democratic acceptance speech of the last twenty years; there was a series of swings at John McCain that, while often effective, seemed more appropriate to a veep's speech than to an address by a Presidential nominee; and then there was a half-hearted attempt to return, in the speech's final third, to the themes of post-partisanship and national unity that defined his '04 convention speech. The whole thing felt schizophrenic - part Clintonian laundry-list, part McCain-bashing polemic, part "beyond red and blue" peroration - and watching it I was left with the impression that Obama would have been better off just sticking with the high-flown inspirational style that got him here, and waiting for the debates to recast himself as the meat-and-potatoes guy who can throw a punch and get down into the policy weeds. Hindsight is 20/20, of course, and you can see what Obama and his speechwriters were trying to do - namely, have the best of both worlds, by being soaring and substance-oriented, combative and post-partisan. But the substance was predictable, thin, and rife with pandering, the combativeness felt faintly inappropriate, and the speech didn't soar nearly as much as it should have. It was a historic evening, for Obama and for America, and there were moments that gave me shivers just watching on TV - but if you didn't go in sold on the Democratic nominee, I think it was ultimately something of a letdown. Robert's Stochastic thoughts: Brad DeLong agrees with Matthew Yglesias: This tends to uhm strongly suggest that they are both right, but I beg to differ. The question is whether the Gallup tracking poll fluctuations which totally control my mood are due to sampling error alone. I say no. Brad writes something along the lines of "yes" or "don't panic"
With one day overlap you can calculate the change in 2 day averages (3/2)(change in 3 day as one day is the same). So about 10% convention bounce so far. sample sizes only around 1800 so var dif around 1/2000 so var dif of dif around 1/1000 se around 3.2% so change over 3 standard deviations. The evidence of a convention bounce (including Michelle and Hillary but not Bill and Joe) is statistically significant. People do change their minds based on cheering Germans, dumb dumber dumbest negative ads and party conventions. Those people might be so flighty that there is no way to guess what the hell they will do on election day, but they do exist. "Normal fluctuations which you shouldn't have a cow about because they tell you virtually nothing about who will be elected" and "fluctuations due to sampling error" are not synonymous statements. But when I take the data since July 20 and regress the Obama share on a time trend allowing for the MA(3) character of the residual, I get a t-statistic of -0.97; when I omit the "bounce" day of yesterday from the sample, I get a t-statistic of -1.37; and when I regress the Obama share on a time trend and on a "bounce" dummy variable covering yesterday August 27, I get a t-statistics of +1.37 on the bounce. I don't believe that t-statistics of less than 1.5 in absolute value are causes for mood swings. What's going on? Why are my regressions different than RJW's first-principles variance calculations? According to Robert's calculations, the standard deviation of the one-day change in the moving average should be 0.78%. But the empirical standard deviation is 1.17%. There's day-to-day noise in the sample that does not come from standard statistical sampling error. Why Oh Why Can't We Have Better Pollsters? Matthew Yglesias » The Three Day Itch: One thing a week’s vacation from blogging helps you get perspective on is the Gallup tracking poll. On August 1 when I had my last day at The Atlantic it was time for panic as McCain had tied things up. Then Obama started to regain ground, going up to a four point lead. Then the race tightened again, then Obama opened up a five point lead, and now it’s tightening again but with Obama back to a smallish lead having beaten back the strong challenge McCain was mounting around August 1. In short, McCain’s “Celebrity” ad and drilling attacks were working well, but when the McCain campaign went after Obama on the tire gauge thing he came up with effective countermeasures and regained his lead. Or maybe none of that happened. As everyone knows, there’s sampling error associated with polling. As a result, if you poll 1,000 people on August 1 and then you poll 1,000 different people on August 2 you shouldn’t be surprised to see the results differ by several percentage points even in the absence of any change in the underlying public opinion. Beyond that, doing one poll per day throughout a long campaign would mean that you’d expect to see one or two relatively rare outlier results per month even under circumstances of total stasis. And as Alan Abramowitz points out if you look at the daily results this is actually what you see — incredible volatility with Obama’s lead oscillating violently around an average of 3-4 points. Since it’s not plausible that the public mood is really swinging anywhere near as rapidly as a very naive reading of the Gallup daily results would suggest, people could see that this is basically statistical noise in a stable race. What is happening is that the rounding errors are being passed through an amplifying filter with a strong spectral peak at the three-day period--and so the three-day cycles in the estimated daily numbers are freaking out. (1) The standard deviation of the difference between today's sample and the sample of three days ago should be 2.35%--meaning that the daily change in the moving average has a standard deviation of 0.79%. only a one-day change in the moving average of 2% is interesting--smaller changes are likely to be statistical noise from a hypothesis-testing point of view. (2) The difference between today's moving average and the moving average of two days ago is one-third the difference between the sum of today's and yesterday's sample and the sum of the samples from three and four days ago--meaning that the two-day change in the moving average has a standard deviation of 1.11%. A two-day change in the moving average of 2% is not nearly as interesting as a one-day change of 2%--statistical noise grows from the one to the two-day change. (3) The difference between today's moving average and the moving average of three or more days ago is one-third the difference between the sum of the most recent three days and the previous or further back three days--meaning that the standard deviation of the three-day change in the moving average should be 1.36%--meaning that a two-day change of 2% is truly not very interesting to a hypothesis tester at all: only a 3% move over three or more days is truly statistically interesting (and, of course, the more persistent such a move is at the more than three-day horizon the more interesting it is). The right way to deal with the Gallup tracking poll is, I think, to compare it to how it was at some benchmark date in the past, and then to ignore all changes in the Obama or McCain share of less than three percentage points--ignore all changes in the spread of less than six percentage points. Paul Krugman: Why We Whine! Stagnation nation - Paul Krugman - Op-Ed Columnist - New York Times Blog: Some clarification about just why the latest income/poverty/insurance report was so bad. There was a significant rise in income among Americans over 65 — those who get much of their income from Social Security. In fact, they’ve been seeing income gains all through the Bush years. But working families haven’t. The picture... shows the median real income of households with the head of household aged 35-44. I’m using that as a proxy for working-age households in general, which the Census unfortunately doesn’t give in an easy-to-use form in its historical tables. As you can see, income has its ups and downs, but in the past each peak was higher than the last one. That was even true, barely, in the energy-crisis-ridden 1970s. But in this decade, incomes first fell in the recession, then basically flattened out at a level well below its previous peak. That’s really a miserable performance. Marc Ambinder: The McCain Ad Shell Game: McCain campaign airs provocatively misleading ads. The press has a conundrum. If we want to point out how misleading they are, we air the ad. McCain's campaign wins the point. If refuse to point out how misleading they are, McCain's campaign escapes criticism. And if Marc Ambinder does not repeatedly and frequently say "today that lying liar John McCain broadcast more lying ads," then he is not part of the solution. We are not sure that "recession" is a useful and meaningful term. Why Oh Why Am I Berkeley's "China Economy" Expert? Because Yingi has gone to Chinghua and Chang-Tai has gone to Chicago and students--the blighters--want to learn. James Hamilton (2005), "What's Real About the Business Cycle?" This paper argues that a linear statistical model with homoskedastic errors cannot capture the nineteenth-century notion of a recurring cyclical pattern in key economic aggregates. A simple nonlinear alternative is proposed and used to illustrate that the dynamic behavior of unemployment seems to change over the business cycle, with the unemployment rate rising more quickly than it falls. Furthermore, many but not all economic downturns are also accompanied by a dramatic change in the dynamic behavior of short-term interest rates. It is suggested that these nonlinearities are most naturally interpreted as resulting from short-run failures in the employment and credit markets and that understanding these short-run failures is the key to understanding the nature of the business cycle. Federal Reserve Bank of St. Louis Review, July/August 2005, 87(4), pp. 435-52. May I say that I am glad I don't spend my life reading things like the things Belle Waring reads? John & Belle Have A Blog: Gay Marriage: Still a Good Idea: The Federalist Society has sponsored an on-line debate between proponents and opponents of gay marriage, in which the...ah, how shall I put this...total failure of the opponents to muster any good arguments at all is the most salient point. N>othing new here, of course. By the way, you may all be amused to know that I was contacted by an earnest Brigham Young student who wanted to use my bizzaro-world arguments in a debate. I explained that I didn't agree with them at all but he was nonetheless welcome to them. So, I did my part to advance the cause of evil in this world. Well, look, it was a teeny, tiny part of evil, and he seemed so clean-cut and articulate! Dale Carpenter and Andy Koppelman: How about some compelling arguments of all sorts. Utilitarian! Based on innate human dignity! Taking into account existing gay families with children! We got'em all! Robert Nagel: Let's face it, if we let gay people get married we'll have to act like there's nothing wrong with being gay. Amy Wax: Anti-monogamy gay men will form marriage sleeper-cells which will detonate into wanton heterosexual promiscuity! And it's not as good for children to grow up in households where they aren't biologically related to both parents. D.C. and A.K. What? What does that have to do with anything? Robert Nagel: The fact that gay-marriage proponents have absolutely all the good arguments on their side is...suspicious. Plus, in this new dystopic gay-married future, we no longer be permitted to sing songs with heterosexual themes! You don't believe me, do you? Nagel: "I fear that the drive for gay marriage will end in frustration and in a sustained effort to obliterate from our schools and libraries and conversations and songs the rich heritage associated with traditional marriage." In a world of frictionless, completely globalized trade, people on average would all be richer--but every society would include a wider range of class, comfort, and well-being than it now does. Those with the most marketable global talents would be richer, because they could sell to the largest possible market. Everyone else would be poorer, because of competition from a billions-strong labor pool. With no trade barriers, there would be no reason why the average person in, say, Holland would be better off than the average one in India. Each society would contain a cross section of the world’s whole income distribution—yet its people would have to live within the same national borders. A further problem is that China’s business and governmental leaders are all too aware of how the smiley curve affects them. Yes, it’s better to have jobs that pay $1,000 a year than none at all. But it would be better still to have jobs that pay many times as much and are at more desirable positions along the curve. If the United States were in China’s position, it would be doing everything possible to bring more high-value work within its borders—and that, of course, is what China is trying to do. Everywhere you turn you see an illustration. Just a few: In the far north of China, Intel has just agreed to build a major chip-fabrication plant, with high-end engineering and design jobs, not just seats on the assembly line. In Beijing, both Microsoft and Google have opened genuine research centers, not just offices to serve the local market. Down in Shenzhen, Liam Casey’s company is creating industrial-design centers, where products will be conceived, not just snapped together. What was recently a factory zone in Shanghai is being gentrified; local authorities are pushing factories to relocate 10 miles away, so their buildings can be turned into white-collar engineering and design centers. At the moment, most jobs I’ve seen the young women in the factories perform have not been “taken” from America, because in America these assembly-type tasks would be done by machines. But the Chinese goal is, of course, to build toward something more lucrative. American complaints about the RMB, about subsidies, and about other Chinese practices have this in common: They assume that the solution to long-term tensions in the trading relationship lies in changes on China’s side. I think that assumption is naive. If the United States is unhappy with the effects of its interaction with China, that’s America’s problem, not China’s. To i magine that the United States can stop China from pursuing its own economic ambitions through nagging, threats, or enticement is to fool ourselves. If a country does not like the terms of its business dealings with the world, it needs to change its own policies, not expect the world to change. China has done just that, to its own benefit—and, up until now, to America’s. Are we uncomfortable with the America that is being shaped by global economic forces? The inequality? The sense of entitlement for some? Of stifled opportunity for others? The widespread fear that today’s trends—borrowing, consuming, looking inward, using up infrastructure—will make it hard to stay ahead tomorrow, particularly in regard to China? If so, those trends themselves, and the American choices behind them, are what Americans can address. They’re not China’s problem, and they’re not the fault of anyone in Shenzhen. The curve is named for the U-shaped arc of the 1970s-era smiley-face icon, and it runs from the beginning to the end of a product’s creation and sale. At the beginning is the company’s brand: HP, Siemens, Dell, Nokia, Apple. Next comes the idea for the product: an iPod, a new computer, a camera phone. After that is high-level industrial design—the conceiving of how the product will look and work. Then the detailed engineering design for how it will be made. Then the necessary components. Then the actual manufacture and assembly. Then the shipping and distribution. Then retail sales. And, finally, service contracts and sales of parts and accessories. The significance is that China’s activity is in the middle stages—manufacturing, plus some component supply and engineering design—but America’s is at the two ends, and those are where the money is. The smiley curve, which shows the profitability or value added at each stage, starts high for branding and product concept, swoops down for manufacturing, and rises again in the retail and servicing stages. The simple way to put this—that the real money is in brand name, plus retail—may sound obvious, but its implications are illuminating. At each factory I visited, I asked managers to estimate how much of a product’s sales price ended up in whose hands. The strength of the brand name was the most important variable. If a product is unusual enough and its brand name attractive enough, it could command so high a price that the retailer might keep half the revenue. (Think: an Armani suit, a Starbucks latte.) Most electronics products are now subject to much fiercer price competition, since it is so easy for shoppers to find bargains on the Internet. Therefore the generic Windows-style laptops I saw in one modern factory might go for around $1,000 in the United States, with the retailer keeping less than $50. Where does the rest of the money go? The manager of that factory guessed that Intel and Microsoft together would collect about $300, and that the makers of the display screen, the disk-storage devices, and other electronic components [in Malaysia, Korea, and elsewhere outside China] might get $150 or so apiece. The keyboard makers would get $15 or $20; FedEx or UPS would get slightly less. When all other costs were accounted for, perhaps $30 to $40—3 to 4 percent of the total—would stay in China with the factory owners and the young women on the assembly lines. In case the point isn’t clear: Chinese workers making $1,000 a year have been helping American designers, marketers, engineers, and retailers making $1,000 a week (and up) earn even more. Plus, they have helped shareholders of U.S.-based companies. Today’s news confirms what America’s struggling families already know – that over the past seven years our economy has moved backwards. We have now lived through first so-called economic ‘expansion’ on record where typical families saw their incomes fall, and working-age households lost more than $2,000 from their paychecks. Another 816,000 Americans fell into poverty in 2007 – including nearly 500,000 children – bringing the total increase in Americans in poverty under President Bush to 5.7 million. And on Bush’s watch, an additional 7.2 million Americans have fallen into the ranks of the uninsured. This is the failed record of George Bush’s economic policies that Senator McCain has called ‘great progress.’ While Senator McCain is promising four more years of the failed Bush economic policies, my economic plan will restore bottom up economic growth that benefits all Americans by cutting taxes for working Americans, providing affordable, accessible health care for all, and investing in new energy, education and infrastructure so we can create millions of good jobs here in America,” said Senator Barack Obama. Between 2000 and 2007, median income for working age households fell by $2,176. When elderly households are included, median income declined by $324 over the same period. This is the first economic expansion on record where typical households have seen their incomes decline. Under the Clinton Administration, median household income increased by $6,200. Based on declining wages over the first 7 months of this year, median household income is likely to fall by at least $700 in 2008, bringing total income lost for the typical household under the Bush Administration to over $1000. An additional 816,000 Americans fell into poverty in 2007, bringing the total increase in Americans in poverty under President Bush to 5.7 million. 500,000 children fell into poverty in 2007. There are 1.7 million more children living in poverty than in 2000. Between 2000 and 2007, an additional 7.2 million Americans have fallen into the ranks of the uninsured. This is the largest increase in the number of people without health insurance of any Presidential Administration on record. The share of Americans with private health coverage fell from 67.9% in 2006 to 67.5% in 2007. This share has fallen every year that President Bush has been in office, declining a total of 5 percentage points since 2000.